Ferdinard: Poetry is a game of loser-take-all. 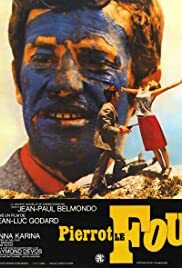 The previous commentator criticizes Pierrot Le Fou as a movie that cannot be classified.The fact that a movie cannot be pigeon-holed is surely a plus,as it doesn't conform to a single cliché as Godard achieves a synthesis of many genres :noir,gangster,political thriller,love story and musical to name a few.The film is a history not only of cinema but of art and civilization, what Proust or Joyce attempted with the novel Godard does with the camera. Another criticism is the use of loud colors,this was intentional as he uses the primary cinematic colors in addition to the recurring theme of red,white and blue- France's national colors as well as those of imperialist Russia,United Kingdom and America.At the time recent history in Europe was one of grainy monotone austerity, death-camps and ration-books, the use of loud colors was a celebration of life and reaction against this. The next criticism leveled is that it is too personal, indeed this is cinema-auteur at it's best and it is intentional.Just as in Pulp Fiction the Travolta/Jackson dialog about the cultural nuances between America and Europe(Royale with cheese/Didn't go into burger king) is basically Tarantino's travelogue of his time on the other side of the pond. The film is deeply political and still relevant today.Take Pierrot's explanation of the Man on the the moon's suffering at the expense of Soviet and American expansionism as they vie for control of the heavens(the space-race) "He is trying to escape in a hurry, the Russians tried to stuff his head with the complete works of Lenin so he sought refuge with the Americans but Uncle Sam stuffed a bottle of Coca Cola in his mouth,having forced him to say thank you beforehand." Indeed a parallel could be drawn with the ungrateful Iraqis who don't appreciate their liberation. Another criticism is the disorientating effect of the voice overs and out of sync sound effects.Pierrot himself refers to this at the party at the start of the film "A machine to see:my eyes, to speak :my mouth, to hear :my ears but instead of having the impression of being a single person I feel like many." 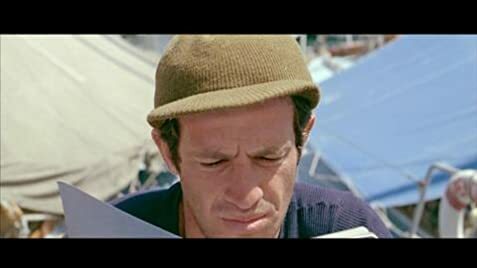 Which conveys modern man's fragmentation and dislocation while reminding us of the power of image and sound to disorientate for the purposes of political propaganda. As for no trace of beauty, my god are you blind? As the entire film is one continuous flirt between the foxy Marianne and the camera. "Why does Pierrot paint his face blue?" .Well why does Travis Bickle shave himself a Mohican's hair do in Taxidriver? These may seem rather arbitrary at first but then again so are all the other thousand and one clichés in cinema such as the man offering the femme fatal a light for her cigarette,wanna take in a movie? wanna grab a coffee? What in the name of God are they all about?A cliché has too start somewhere, unfortunately the lead man painting his face blue didn't catch on.Mores the pity.